Home » Archive by category "Salads"
I got tired of lentil soup and decided to reinvent lentils. This recipe combines lentils with apples, herbs, olive oil and other seasonings. Serve my Lentil, Apples & Herbs on July 4th! 1. After lentils have cooked, drained & cooled, transfer them to a large serving bowl. 2. Add chopped red onion and celery to bowl with lentils; set aside. 3. Cut apple into fourths; core apple. 4. Cut apple fourths into 1/8-inch thick slices; cut slices into slivers; set aside in a small bowl. 5. Immediately add lemon juice to apple & gently toss; set aside. 6. Add olive oil, Balsamic vinegar to lentils; set aside. 7. Meanwhile, finely chop 5 mint and oregano leaf sprigs (discard stems). 8. Add chopped mint, oregano, salt and ground black pepper to lentils in bowl; toss. 9. 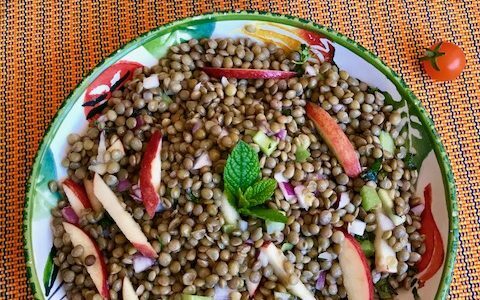 Drain lemon juice from apple slivers; toss apple slivers into lentil salad. 10. Taste the salad and, if needed, adjust seasonings. 11. Serve Lentils, Apples & Herbs immediately or prepare up to 4 hours ahead and refrigerate (covered). 12. The salad will keep (refrigerated) up to 3 days. Nopal is from the Nahuatl word nohpalli for the pads of the cactus plant. There are over 100 known species of cactus in Mexico. 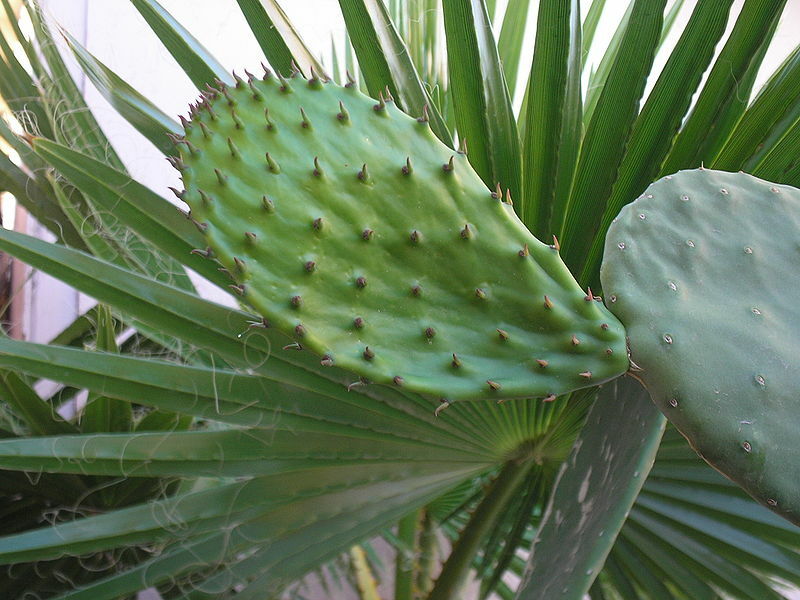 The nopal pads are eaten raw, cooked and even grilled. They are used in stews, soups, jams and salads. 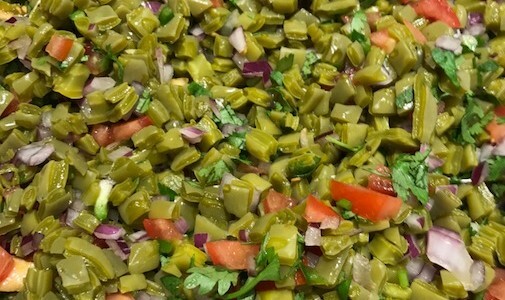 Since nopales are abundant in Vitamin C and Manganese, you’ll enjoy a cactus salad that is delicious and good for you. Buen provecho! 1. Working on a chopping board, cut the cactus leaves into ¼-inch thick strips. 2. Cut the strips into ¼-inch pieces; set aside in a bowl. 3. In a 4-quart saucepot, bring water to a boil. Add half of the brown or white onion and garlic cloves to water; boil for 3 to 5 minutes. 4. Add chopped nopales to the onion-garlic water; cook on medium, uncovered, for 5 minutes or until the green color has become lighter. 5. After 5 minutes, add ¾ teaspoon salt and taste a few nopal pieces – the texture should be crunchy-tender, not overcooked. 6. Place a colander in sink and drain the nopales. Run cold water through nopales; set aside in colander set over a bowl to drain. 1. Finely chop red onion and place it in a bowl, covered with cold water; set aside. 2. Cut each tomato in half; scoop out and discard the pulp. 3. Cut tomato flesh into ¼-inch strips; cut each strip into 1/4-inch pieces. 4. Place chopped tomatoes in a 2-quart glass or porcelain bowl. 5. Add drained nopales to the tomatoes in bowl. 6. Lift chopped onion out of water; squeeze out the excess water. Add onion to nopales mixture in bowl. 7. Finely chop Serrano or Jalapeño chile; add it to the nopales mixture in bowl. 8. Rinse cilantro in cold water and finely chop it; add cilantro to nopales salad. 9. Stir in the extra virgin olive oil with about ½ teaspoon salt; taste salad and adjust seasonings. Serve immediately. 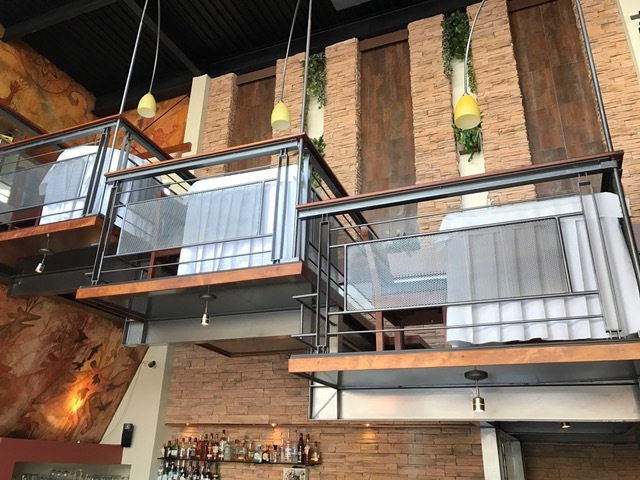 Just a few days ago my husband and I went to IPAA Cocina Mexicana Restaurant in Tijuana, Baja California, Mexico. I loved the private terrace dining style. If you want a romantic dinner, this is the place! The restaurant’s interiors are high-end – no cutting corners here. And, the astounding mural evokes prehistoric themes. IPAA’s cuisine represents the natural foods grown in Baja California for thousands of years. It’s classified as fine, Baja-Med cuisine. The menu changes on a daily basis and the six-course dinner with wine-pairing is fantastic! 1. Using a sharp knife, cut the green tomatoes into fourths and then into eighths. 2. Transfer the green tomato pieces to a 2 to 3-quart glass or porcelain bowl; set aside. 3. Cut the yellow tomato into fourths and then into eighths; add them to the green tomatoes in bowl; set aside. 4. Cut the cherry tomatoes in half and add them to the tomatoes in bowl. ; set aside. 5. Alternatively, if using the large, red tomato, cut it into eighths. Add the red tomato pieces to the other tomatoes in bowl. 6. Add salt and ground black pepper to the tomatoes, followed by the olive oil and fresh dill weed. 7. Toss the salad and serve immediately as a side dish to meat, chicken, fish or as part of a vegetarian meal. Need a fresh, new salad? Make this sweet-and-savory salad with raspberries and Persian cucumbers (they’re small and loaded with flavor). The salad gets its kick from the raspberries’ sweet-tart flavor. 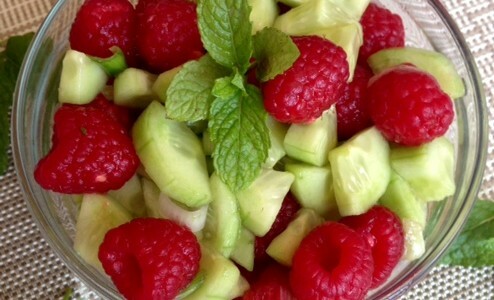 Serve this Raspberry-Cucumber Salad alongside fish or poultry or with vegetarian selections. 1. Cut each cucumber in half, lengthwise. 2. Cut each half, lengthwise – now you have fourths. 3. Cut the cucumber fourths crosswise into 1/4-inch pieces. Set aside in a glass or porcelain serving bowl. 4. Repeat same cutting procedure with the remaining cucumbers; add them to the bowl. Set aside. 5. Add lime juice, olive oil, salt, black pepper, agave nectar and Serrano chiles to cucumbers in bowl; toss and set aside. 6. Add the raspberries and gently toss, taking care not to crush them. 7. Taste and adjust seasonings. Garnish with mint leaves and serve immediately.